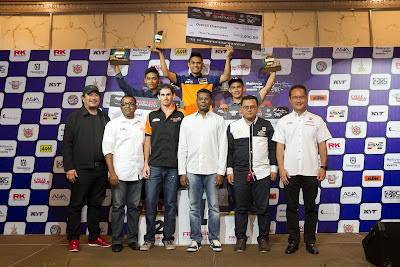 The fourth and final round heard the roar of Malaysians as Muhd Habibullah (#27 Gabit) takes the FIM Asia Supermoto Championship 2016 for both Open International and Asian Class. He is the first and only person to win at both classes against 21 top international riders from 18 countries. 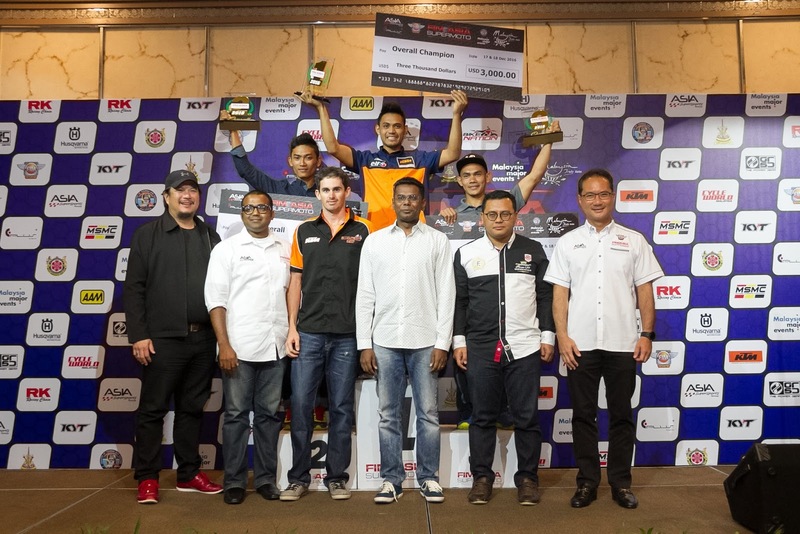 The Asian Class podium was followed by Khairi Zakaria (Hairi) and Mohd Al-Amirul Ashshahid (Gaban) who took the first and second runner-up respectively. A grand gala dinner was arranged after the race in celebration of the successful campaign. (Clockwise) First runner-up, Khairi Zakaria; Champion, Muhd Habibullah; Second runner-up, Mohd Al-Amirul Ashshahid; Dato’ Eric Loo, Chairman of ASG; YB Tuan Amirudin bin Sharil, Selangor State Executive Councillor for Youth Development Sports, Cultural and Entrepreneurship Development; Tony Nagamaiah, General Manager of Malaysia Major Events; Australian rider Andy McLiesh; Satheswaran Mayachandran, CEO of ASG; and Andrew Ching, CEO of E-Plus Global Sdn Bhd. “Riders from Asia has proven to be as competitive as other international riders. We believe that this championship will be the footstep for us to improve our skills and spearhead the Supermoto scene,” he added. Gabit concluded his winning speech with a chant of ‘Malaysia Boleh’. Gabit completed the race with a best lap time of 53.496 against qualifying leader Richard Dibeen in a neck to neck battle for the title in the final race, with near to collision incidences happened at the final turn of the track. 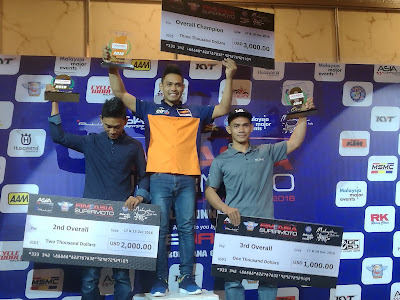 While it was disappointing for Gabit’s brother, Gaban, who ended his brawl earlier than expected due to machine malfunction at Race 2, Gabit surfed through the track with confidence, sweeping both titles at home ground. Gabit scored a total of 171 points standing at the Open International Class, followed by Australia’s Andrew McLiesh with 138 points, Malaysia’s Mohammad Khairi bin Zakaria with 123 points, Malaysia’s Mohd Al-Amirul Ashshahid (Gaban) with 112 points, New Zealand’s Richard Dibben with 108 points and Japan’s Takashi Sasaki with 87 points. 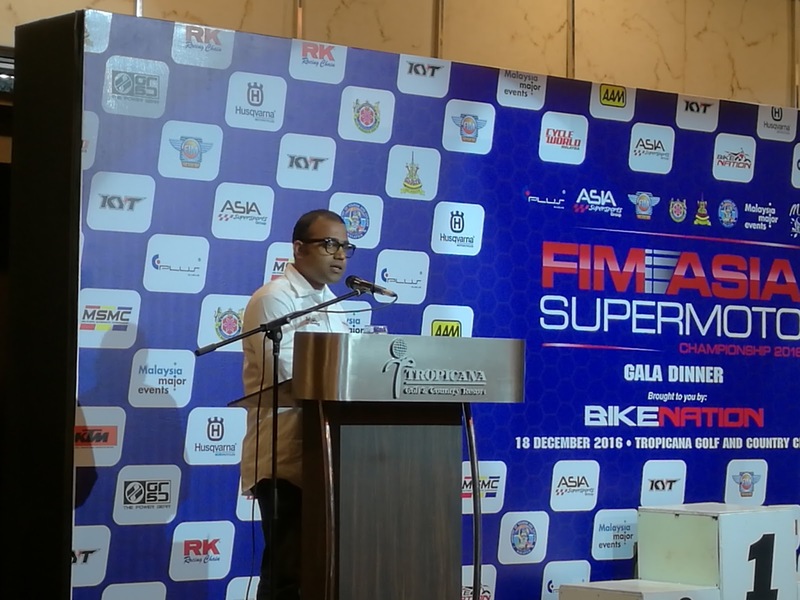 Satheswaran Mayachandran, CEO of ASG, delivering a speech at the grand gala dinner. For more information, visit http://supermotoasia.com. 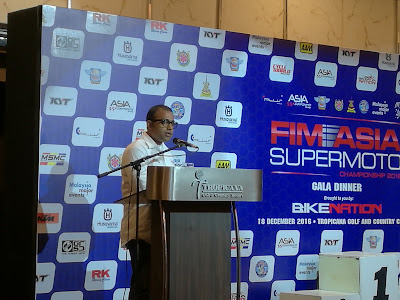 FIM Asia Supermoto Championship is organised by Asia Supersports Group, a consortium of three companies namely Bikenation Motorsports Sdn Bhd, CW Media Sdn Bhd and E-Plus Entertainment Productions (M) Sdn Bhd, with international supporters from the Ministry of Tourism and Culture Malaysia, Malaysia Major Events, Selangor State Government, Shah Alam City Council, Concorde Hotel Shah Alam, Destination NSW, Tourism Hunter, Newcastle City Council, FIM Asia, Automobile Association of Malaysia (AAM), KYT, KTM Malaysia,Premium World Motorsports (PWM) Sdn Bhd, official distributor of Husqvarna in Malaysia, RK South Asia Sdn Bhd, Liputan6.com, Bola.com, Vidio.com and iM4U.